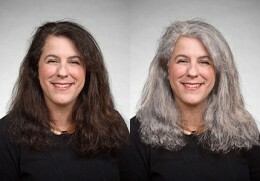 As research for Going Gray, 500 people responded to a survey Anne designed to probe people’s concerns about aging. 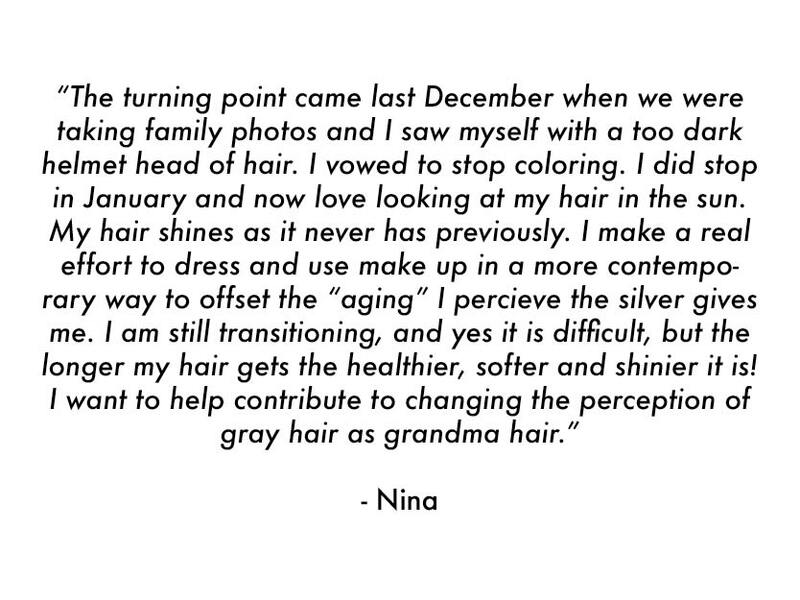 In the photo section of the survey, she wanted to answer the $64,000 question: exactly how much older does gray hair make people look, and is it regarded as inherently unattractive? Anne asked two 30-somethings, two 40-somethings and two 50-somethings, two with naturally brown hair, one who’s gray, three who use artificial color – to pose for pictures. She posed too. 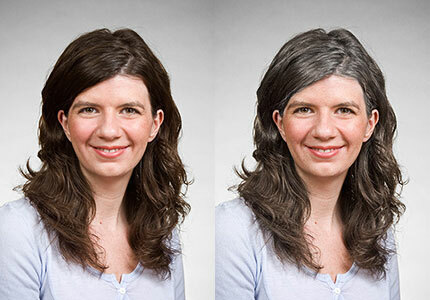 Anne then had the images Photoshopped to produce 14 images: all seven of the people as brown-haired and as gray. Each survey contained randomly selected versions of each person. 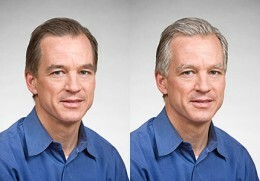 A given survey respondent only saw each face once, either as a brown-haired person or gray-haired and related questions: Would you fix this person up with a friend? How old do you think this person is are? Anne's assumption going in was that people with gray hair would be deemed less attractive – that is, less likely to be chosen as a fix-up for a friend. And in a section of the survey where she simply asked women if they thought men find women with gray hair less attractive, by a two to one margin the respondents said yes. But the results of the almost-identical-twin photo-test went the other way, completely surprising Anne. For Barbara, who has a lot of dark hair, the Photoshopped-very-gray hair did indeed maker her perceived as less fix-uppable, and for the fake-gray, 38-year old Emily T., there was a tiny disadvantage. But for the rest of the people, four out of six women, there was a modest but consistent advantage in fix-up-ability for the gray-hired versions of ourselves. And gray hair made only the youngest of the women and the one man – Alison, Emily T. and Tom – appear older than they actually were. 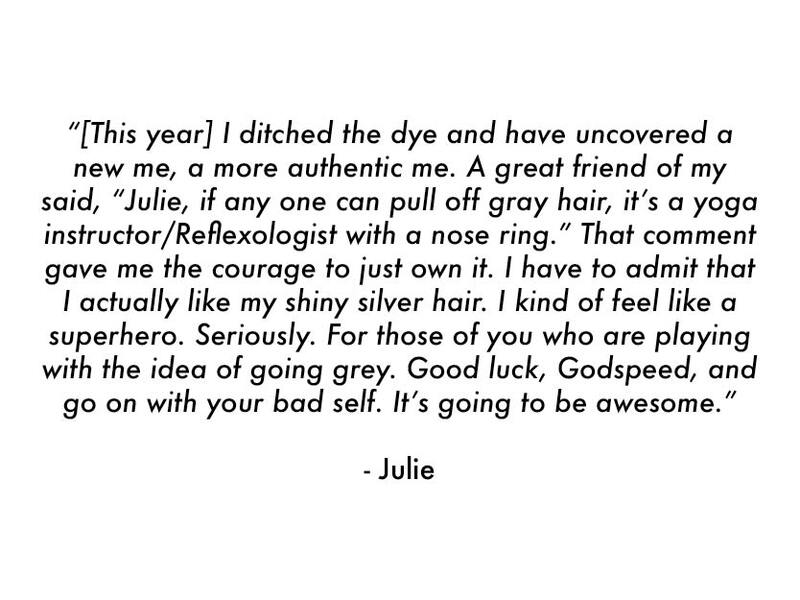 To Anne, the data indicates that when gray hair is age-appropriate (from our 40s onward) we don’t actually fool people about our age when we dye it.